The Body of Benchers and Body of Senior Advocates of Nigeria have described the late Attorney-General of Rivers State, Emmanuel Aguma (SAN), as a dedicated legal practitioner, who served the legal profession creditably. 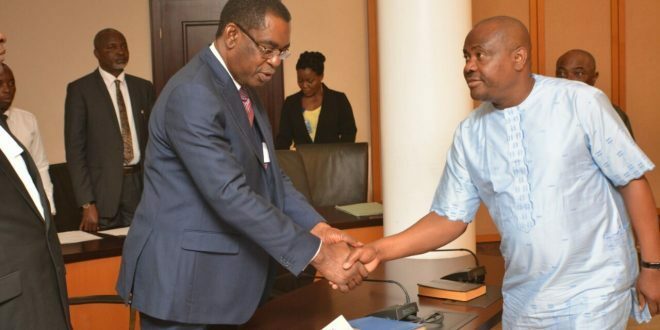 The senior law bodies eulogised their departed colleague, yesterday, during their condolence visit to the Rivers State Governor, Nyesom Wike, at the Government House, Port Harcourt. READ ALSO: Wike commends Ibiyeomie for contributing to Rivers’ devt. Leader of the delegation and former president of the Nigeria Bar Association, Chief Onueze Okocha, said Aguma’s untimely demise was very painful. He said: “We are here to condole with the government and the people of Rivers over Aguma’s death. It was very shocking because we saw him discharging his responsibilities till the end of June. Okocha urged the governor and members of the SEC to bear the loss. The former NBA president extended the bodies’ condolences to the bereaved family. “He supported all our activities, having been a secretary and chairman of the NBA, Port Harcourt branch. He was a statutory member of the Body of Benchers,” Okocha said. In his response, Governor Nyesom Wike said Aguma’s death was painful and that it would be difficult for the state to come out of it. The governor said as a result of Aguma’s competence and dedication, the state didn’t witness a legal crisis since 2015. Wike urged the senior lawyers to actively participate in the burial activities for the deceased, between today and September 16.